When Starlight Express premiered back in 1984, Andrew Lloyd Webber's score and Midas touch were rolled up in a swirling, glittering vision of a child's imagination that enchanted and mesmerised audiences from the very first moment. The magical hinterland and boundless possibilities of a young person's mind remain as exciting as ever and, coupled with one of Lloyd Webber's finest musical works, Starlight Express has developed an ageless quality. Written in 1983, for the composer's children, Starlight Express ran in London's West End for more than 7,000 performances and enjoyed productions all over the world. In 2012, Bill Kenwright and legendary director and choreographer Arlene Phillips are taking Starlight Express back out on the road with a UK tour that kicks off in May. Arlene Phillips may be best known to television audiences as a judge on various dance shows but her dance credentials are almost without comparison. Having previously directed and choreographed tour and West End productions of Starlight Express, Arlene's credits also include Joseph and the Amazing Technicolor Dreamcoat, The Sound of Music, Grease, We Will Rock You and Jesus Christ Superstar. Her expertise, combined with Lloyd Webber's score, Richard Stilgoe's lyrics and Bill Kenwright's production makes for a popular, heady mix. The new tour is greatly anticipated. 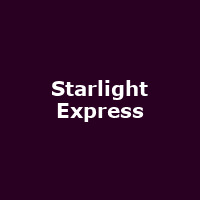 Starlight Express begins its UK tour in Wimbledon from 10th to 19th May, before a national run that includes runs in Bradford (29th May - 16th June), Salford (19th - 30th June), Liverpool (17th - 24th July) and Aberdeen (2nd - 13th October), among others. We have some dates available now, priced from around £25, with more to follow.